Minimalist home design has become exceedingly popular in recent years, but what does it actually mean? The general principle of minimalist design is the absence of clutter, the removal of all that is unnecessary from an interior. Let’s take counter tops as an example of minimalist interior design within an interior, within a minimalist interior there will be as small number of things placed on them as possible. This often results in a kitchen counter area simply having a microwave, a coffee machine and a knife set placed on them. In order to achieve a minimalist décor in your interior requires stripping each room down to the bare minimum of essential contents and nothing more. However, this reduction of contents should not come at the cost of aesthetics, minimalist stylings are all about beautiful interior. But how to bring this style to life in your interior? Let’s take the living room as an example, this is the room where you and anyone who visits your home will spend the overwhelming majority of their time. In order to create a minimalist theme within your living room, you should remove any clutter that has accumulated over the years. This means getting rid of the stacked magazines which have accumulated there, the assorted books and DVDs which are scattered around and keeping the number of ornaments to a tasteful minimum. Minimalism has become an exceedingly popular home design option in recent years as it is synonymous with cleanliness- and the value of a clean home is unparalleled. 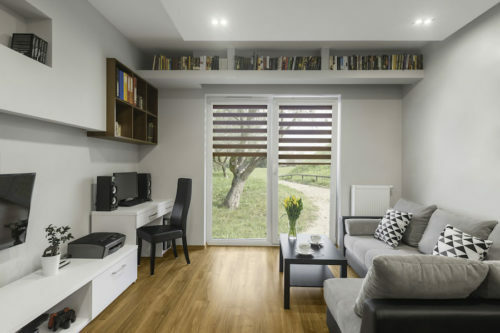 In addition, due to the simplistic yet practical attributes which come from having a minimalist home design, you will have significantly less stress as a result of living there. What Flooring Type Is Best For My Minimalist Home Design? Of all the flooring options available for your minimalist home design, oak flooring is one of the best. This is due to the tasteful aesthetics that this flooring type provides, whilst at the same time adding a sense of increased space to the interior. Best of all, due to the wide range of finish types available, oak flooring can be selected which matches and complements the existing colour scheme within your new minimalist home plan with ease. To ensure that your selected oak flooring meets the requirements of your design plan, request a sample. Oak Flooring Online are experts at the provision of oak flooring solutions for use in minimalist interiors, for further information, a member of our customer service team can be contacted by calling: 0800 043 3073.